Editor’s Note: Click here for a more up-to-date article on the International House (May 2014). I spent my first few nights in Medellin, back in early July, crashing with my friend Troy in Itagui. He had found a room to rent through an online apartment search website in Colombia called CompartoApto. I had been browsing the site as well before arrival, however most of the listings didn’t include photos, and in the ones that did, the bedrooms didn’t look to inviting (ie. comfortable, brightly lit). At the same time, I also reached out to a few expat friends I knew from last year. Adriaan over at Colombia Reports referred me to someone hew knew who was renting a room at the International House Medellin in the neighborhood of Belen, Malibu. I called her, and after asking a few cursory questions, e-mailed the owner, Joel Goleburn to come take a look. Upon viewing the apartment, I knew immediately that I’d be comfortable living there. As I already had plans to live with Troy and one of his roommates in September, I ended up living in Joel’s building for 5 weeks. I later learned Joel had been working on it for the last two years, fully renovating it. It had opened for business just a few months prior, so everything was new. The result of all that work is a very beautiful, modern set of apartments. There are 10 rooms for rent. The available rooms are on the 2nd and 3rd floor, while Joel lives on the fourth floor. At the time I lived there, rent was in the range of 450,000 to 600,000 pesos per month, or about $250 to $332. A $100 USD (or equivalent) by Paypal is required to hold a room (returned after move-inspection). There is a one month minimum, and this rate includes a private room, shared bath (there are 2 full bathrooms per floor), all utilities (cable, internet, power, water, local phone), and access to the washer/dryer. 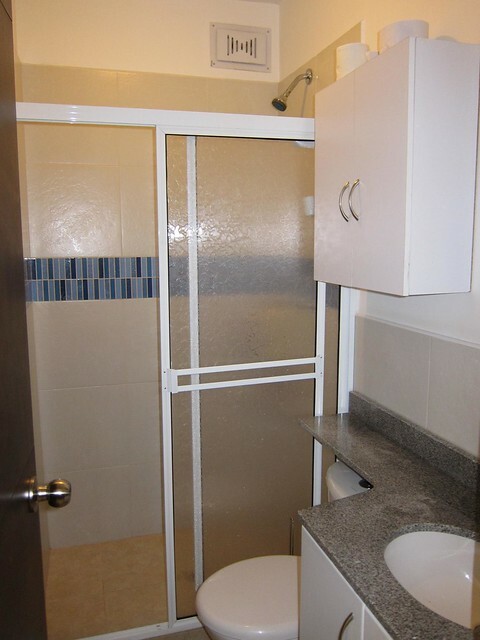 For an additional $5,000 pesos ($2.82) per day, you can have a private half-bath. In August 2010, he opened an Argentine-themed fast food restaurant called La Esquina de Boca on the ground floor. The food is excellent, ranging from freshly made empanadas to spinach and cheese ravioli and an array of pizzas with a crust far better than your typical Colombian pizza joint. It’s a great convenience to have high quality food so close to home, and with a few flat screen TV’s as well, it’d make a great place to watch big sporting events. 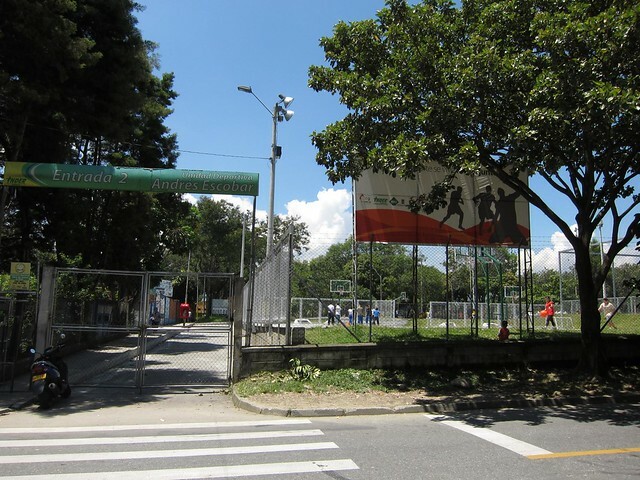 Across the street is Unidad Deportivo de Belen — a popular outdoor sports complex. Across the street from the building is the Unidad Deportivo de Belen, an outdoor sports complex with basketball courts, soccer fields, a swimming pool, and weights. The whole complex has lighting, and is a popular post-work, post-class hangout for people in the neighborhood. As far as I know, it’s free to use, however access to the pool does cost a small fee (about 5,000 pesos, or $3). A view of the living room and kitchen from the balcony. Inside, each stylishly furnished apartment has a small balcony perfect for getting some air or conversely, smoking, and a common area with cable television. I don’t watch a lot of TV while living in Medellin, however it’s always nice to have access to one. Each room includes a smaller TV as well. 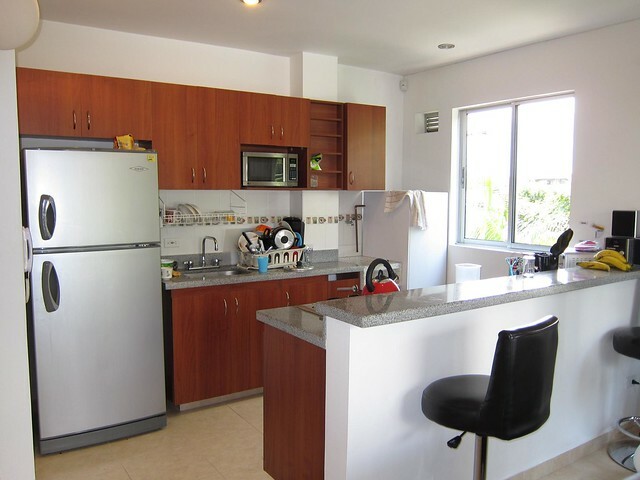 The fully equipped kitchen makes it easy to cook at home. The kitchens are equipped with brand new, modern appliances, and the cabinets are fully stocked with pots, pans, utensils, and enough kitchen supplies to keep the average traveling chef happy. The kitchen table is a common workplace as the wireless internet router is nearby. During the month I spent living on the 3rd floor apartment, I spent a lot of computer time in my room as the Wi-Fi signal was strong enough in there. I can’t speak for the rooms further down the hall, however it was common to see my roommates on their computers at the kitchen table. The printer in the photo above belonged to one of my roommates, and the Wi-Fi router for the apartment sat just below it. A source of some frustration was the Internet access, which seemed to go off at random times for no apparent reason. Usually this was resolved by unplugging the router for a minute, and then letting it power up again. I was never clear on whether that was an issue with the internet provider, Une, or the router. The bedrooms feature firm but comfortable double beds, and plenty of closet space. Included in the room rental were all of the bedding, as well as a towel. A washing machine was located on the ground floor, and free for residents. Clothing could be hung on the rooftop to dry under the sun. 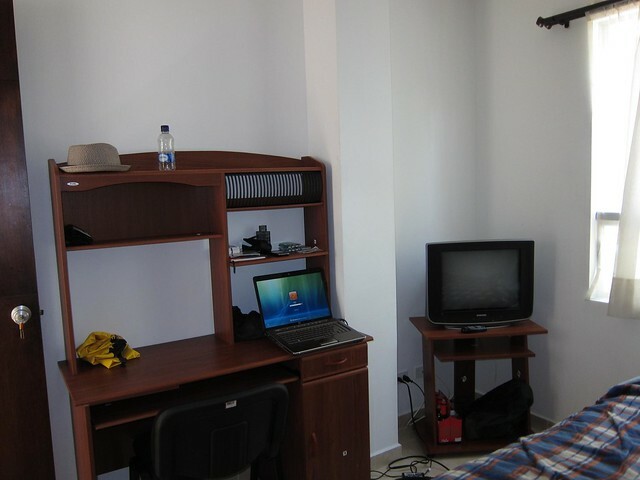 Each room also features cable television, a desk, and a floor fan. My room faced the street and basketball courts, which could create quite a lot of noise at times. In all honesty, I began to hear traffic as early as 6 am on the weekdays. On the weekends, people began to play basketball as early as 8 am. Even with the window closed, it was noisy. At one point I had the option to switch to a room that was across the hall, and further removed from the street noise, however I didnt’ want to give up the large window which allowed for a lot of natural light during the day, and which I often kept open. It is also worth noting that the building is close to the northern end of Medellin’s domestic airport. During the day, jet and prop planes can often be seen taking off and landing. They are so low you can easily make out the airline names on the plane bodies. It’s a cool sight to behold, however the planes are loud enough to require a pause in conversation if you’re outside or on the roof. The bathrooms are cleaned regularly by the building’s housekeeper. I’m a stickler for a hot shower, and I was very happy with the strong water pressure and hot temperatures of the water in the bathrooms. A friendly housekeeper cleaned the common areas of the apartment, including the bathrooms, several times a week. In that respect, I felt very spoiled. This was certainly a big step up from living in a hostel as I did for my first month in Medellin last year. In addition to secure (protected like Fort Knox), quality apartments, there is a wonderful social vibe to International House Medellin. I had several meals with roommates on the rooftop, a free BBQ on the ground floor hosted by Joel, and a lot of fun during my stay. Ironically, I lived with Angela, who wrote a guest article for this blog about how to obtain a student Visa! She was living there with husband Jared, and both were taking Spanish classes at a nearby university, UPB. Lastly, the building is just a few blocks from Bodytech Laureles, an Exito for buying groceries, and a popular nightlife district along Calle 33 (known as La 33). It is also centrally located within the city of Medellin. On the downside, it is not within walking distance of a metro station. The nearest are Estadio, Industriales, and Poblado, which all run about 5,000 pesos ($3) by taxi. If you prefer a cheaper option, there are a ton of different buses that pass by the apartment in any given hour. The rooftop features beautiful 360-degree views of Medellin and the mountains. To read a more recent review from February 2013, go here. 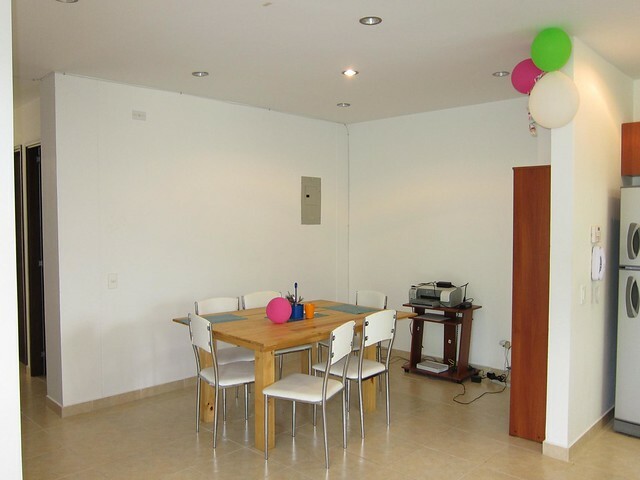 To see more pics and enquire about availability, visit International House Medellin. Editor’s Note: Click here for a more up-to-date article on the International House (May 2014) here on Medellín Living. best deal in town! nice place. he has a waiting list so plan in advance. 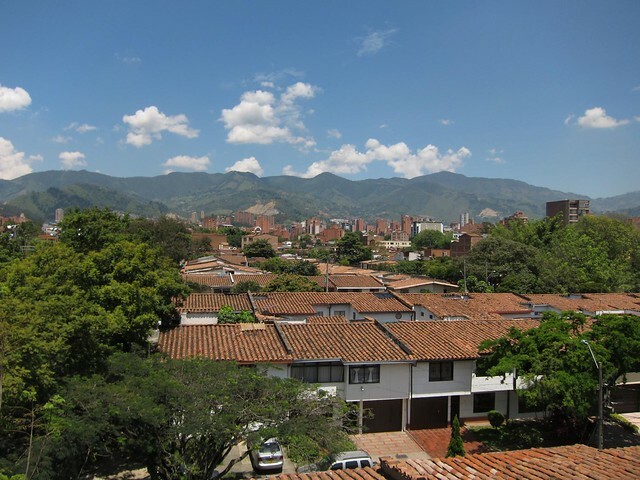 close to UPB university, 1 of 2 great places to study Spanish in Medellin. its a kind of a large b and b style apartment studio building. a great concept, if you are a social person and want to meet some other people in town. not so great for guys that need 5 prepagos a day, but for people hear that want normal lives its a really great spot in town. Joel has spent a couple years working on this place, and still enjoys making renovations side by side with his Colombian helpers. the restaurant looks like its doing great. I’m just finishing up 4 months here at the International House and I can’t say enough nice things about Joel and his place. He is respectful, kind and generous with his time. Living at International House is like sharing a flat with 4 other people. It works best when everyone is respectful of one another and clean up after themselves. Thanks to Joel, it all works pretty well. He provides a valuable service at a fair price. International House is not a hotel, it’s a home for people that find themselves living in Medellin. And it’s a fun and interesting place to live. Can you have guests over for dinner, etc? Yes, you can have friends over whenever, just as if it were your own apartment, however there is a supplemental fee if someone spends the entire night. It’s on the honor system. Joel said it was to account for extra use of the utilities/facilities, but I think it’s more of a measure to keep the guys from going too crazy with the local girls. friends are welcome anytime. there is a charge of $10.000 pesos for overnight guests though, just to prevent too many people from crashing at the house. I recommend contacting Joel directly through his website. Try contacting Joel directly through the apartment’s website. Had a cancelation….have a furnished room open now. $500.000/month including utilities, local telephone, 10mps Wifi throughout building, cable TV, furnished room with queen-sized bed, blanket, desk, desk chair, closet with digital safe, lockable door to your room, security system throughout building, excellent restaurant on 1st floor. If you are looking for a flatmate in medellin or colombia, just go to http://www.aptocomparto.com tons of room for renting, weeks, days. months, share apartment, just sign in and contact people around the city. Si buscas un cuarto, habitacion en medellin, http://www.aptocomparto.com es la solucion, miles de habitaciones y pisos para la renta, dias, semanas o meses. hi all, I have a couple of rooms opening in April. One April 1st and another April 21st. Feel free to give me a call. i have a furnished room opening August 1st. just in town for the feria de la flores. 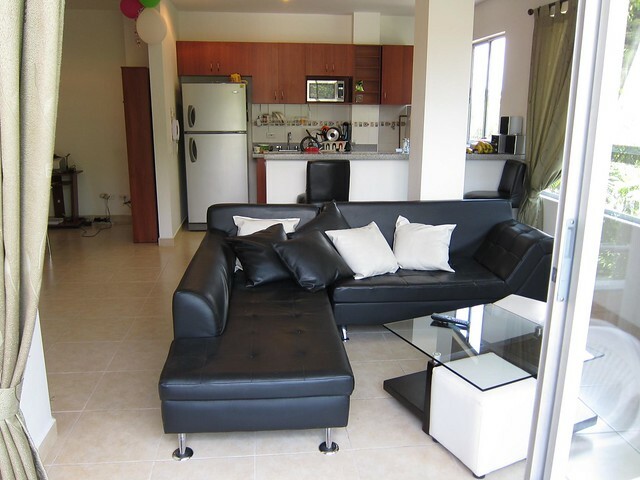 $550.000/month including utilities, some household supplies (e.g., toilet paper), and housekeeping of the common areas. give me a call if you need a place. Cheaper for women? I would be cautious with a colombian who charges women less he probably has other intentions. Joel, the owner of the building, is an American. Not sure why that’s his policy, but let’s face it, your average foreign visitor to Medellin is a greater liability (bringing home local girls, prostitutes, drugs, etc) than your average woman. Just my two cents. Not sure why that’s his policy, but let’s face it, your average male foreigner is a greater liability (bringing home local girls, prostitutes, drugs, etc) than your average female foreigner. Just my two cents. Hi, I’m American. I charge women slightly less to encourage them to live in the building so that there is a healthy ratio of men to women. Mostly men visit medellin and I’d rather make a little less money in order to keep the building balanced with fun people, and create a positive living experience for visiting women as well. I would never do business with someone who had two different prices depending on your gender. It’s sexism against men and I wouldn’t support someone who would do that, on general principle. It’s not like the different price would be the deciding factor for a woman to stay there, so his weak excuse doesn’t wash. If you accept this kind of practice, you would have no problem with a landlord who would set different prices based on your race, justified by the same hollow reasoning: “we want to make sure there is more of a balance here so we charge blacks more than whites because the neighborhood is predominantly black”. James, thanks for your comment. My place is a 12-bedroom community building with common areas shared by all, and I also live there. When you live with and rent rooms to roommates you have the right to live with whomever you choose based on your preferences because you will be sharing common areas. This is legal and is not discrimination. (ex. prefer vegetarian female, no pets, 420 friendly, etc.) What I charge is up to me. I set the rates and can give discounts to friends, family, women, colombians, etc. I have been in the business of renting rooms in group houses for 15 years, and the law recognizes that people have the right to live with whom they want. This is not discrimination and I believe my tenants appreciate my efforts to create a great environment (i interview every potential tenant and look for people with an international background, trustworthy, cooperative, social, easygoing, etc.). I understand if you disagree with my policy. I’ve lived here for 2 years and loved it. Although I can appreciate James’ concern, I must say that the place has had the best atmosphere when the gender has been more evenly mixed. I appreciate that Joel is prepared to accept less money to improve the dynamic, even if it means I’m paying more than someone else. I completely disagree that price is not a deciding factor on where you want to live. Of course, given 2 otherwise equal apartments, any rational person would choose the cheaper one. However, I’m more interested in Mike’s comment. I’d be interested to hear some ladies’ opinions on whether they would actually be worried by the cheaper price. I just spent two months at International House Medellín. I got to know the owner (Joel) fairly well and I have nothing but good things to say about him and his intentions. He is dependable and trustworthy–a normal, upstanding, friendly and even generous individual around whom everyone feels comfortable. He has a passion (and knack) for languages, for goodness sake. Nothing at all dodgy about this guy. The basketball courts and pools across the street are wonderful if you like to do either of those activities. The only complaints I could make about International House Medellín would be stuff that happens in all shared living situations. (Someone didn’t pick up their hair out of the shower drain, etc.) While I was there Joel bought an extra refrigerator for each floor; after that there seemd to always be plenty of space in both. 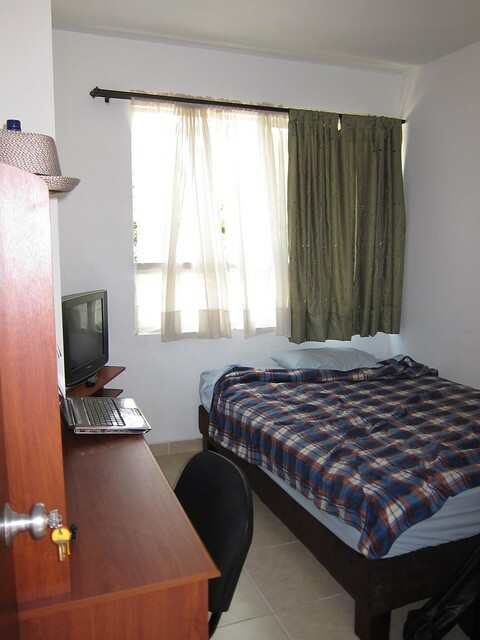 For the price, International House Medellín is in my opinion an excellent choice. I have never been to Medellin but I am looking for a place to retire. I had planned upon Costa Rica and had an apt. there for over a year. In your opinion would this be a good place to start? Sounds like the apt are nice enough! I know no one in Medellin, Easy to meet people? I am outgoing and like to meet and see new things! I’ve Known Joel for a long time. What a great guy! He keeps it real. What a great place to live. My husband and I stayed here five weeks this summer and had a wonderful experience. We felt at home in Joel’s building, met some really great people and were very comfortable in our room. If you’re going to be in Medellin a month or longer I’d definitely recommend checking to see if there’s availability. Also, the rooftop BBQ’s are the best! Hi Joel. just thought you should know your website seems to be down…internationalhousemedllin.com works, but when you go through google it does not come up correctly. BTW, I plan on being there for December for 2 weeks. How do I contact you directly? Every year people leave colombia towards the end of December, so I have some rooms open right now! drop me a line if you are looking. I travelled to Medellín to do social work, I didn’t know anybody there but I met some beautiful people in this Internacional House. The breakfast was always delicious and the view from the roof top was priceless. The only thing bother me sometimes was the sound of the airplanes because is near from an airport. But despite that, was a really confortable place to stay. he tenido una buena experiencia en el International House, vivimos en un grupo de aproximadamente a 20 personas de un montón de países de todo el mundo, y que podría aprender mucho con ellos. La gente del personal de la casa son muy agradables y siempre atento. La casa reglas son simples de seguir, y no tuvimos ningún problema. Me gustó especialmente la vista desde la terraza de la azotea, es posible ver las montañas que rodean la ciudad y también los edificios, es un paisaje agradable! Las habitaciones están bien, todos son nuevos, limpios, mucho mejor que un hostal común. El equipamiento de la cocina son nuevos, y puedes usar todo para hacer su comida. Se puede usar la zona de limpieza para lavar y secar la ropa. La casa está situada en frente de la Unidad Deportiva de Belén” (Belén Sports Center) donde se puede nadar, correr y usar el gimnasio. Cerca de la casa es la calle 33 (calle 33), donde la mayoría de los mejores bares de Medellín. Hay supermercados y centros comerciales cerca de la casa. La International House es, sin duda, una buena elección, porque el personal de personas, normas y calidad de servicios y ubicación. International House, Medellin We had a fantastic time at International House. As soon as we arrived, Joel made us feel at home and gave us tips about the local area. Our room was spacious, the shower was incredible (especially as in South America it’s hard to find a hot shower) and the flat we were staying in was spotless. Every morning we would have our breakfast on the balcony, looking at beautiful views of the mountains and colourful birds in the trees. The terrace is a huge social area with benches, big tables, loads of cushions, a kitchen, washing machines and a dryer. Every time I skyped with anyone I made sure I did it there as the views of the mountains are breathtaking. If you stay there you definitely have to be on the terrace at sunset, the skies are pink and and lights of the city are gold. I took lots of photos! Joel made us a welcome dinner on the terrace on our second day with some of the other housemates. That made us feel very welcome. He is a very relaxed, cool guy and loves meeting different types of people. He is genuinely interested in the people who live there and will go out of his way to help you out. There is a very friendly vibe to the house and I really enjoyed meeting the people there, there were lots of different nationalities. We felt like we had a lot of space to socialise or just to chill out. The Internet connection is excellent and there is also a big TV on the terrace where people can watch films or TV lounging on the cushions. We also had a TV in our room with loads of channels in Spanish and English. Inma and Adriana, who help around International House, were charming and gave us tips on places to go in Medellin. And how could I forget Basco, the adorable labradoodle who lives in International House! He is very cute and reminded me a bit of Will Ferrell (maybe it’s the hair). We were sad to leave Medellin, it’s a fantastic city and we had such a good time in International House. As a place to stay, I can’t imagine how we’ll top it. I wish I was there right now! It makes such a big difference to stay with friendly people who make you feel at home. We hope to go to International House San Francisco, which Joel also runs, one day. Simplemente magnífico! Volvería a quedarme en la International House sin duda alguna! Gracias Joel! I will stay in Medellin for some time and this place sounds just perfect for me, but i am little bit nervous about safeness. So my question would be is this area one of the safer ones ?